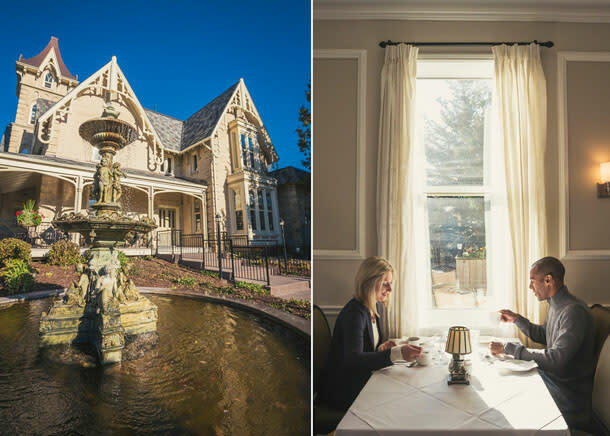 Get to know the Elm Hurst Inn & Spa. General Manager Alon Gurman and Sales Manager Theresa Pinkerton show justifiable pride when giving a tour of the recently renovated Elm Hurst Inn & Spa.After the renovations, completed in 2012, they now have a showcase example of marrying the best of a classic 140 year old building with 49 gorgeous rooms, all with the most modern touches. Not only has the main building been upgraded, its 32 acres of grounds with wonderful fountains equally show off the benefits of upgrades and attentive maintenance. Alon’s international hotel management experience helps bring it all together. He has nurtured staff to the highest levels of professionalism. It starts right when you arrive at the front desk and continues through the superb culinary treats. Dinner, even for a group of over 30 people, was a gourmet culinary experience. How often do we hear about properties claiming easy access from the 401? They’d be hard-pressed to trump Elm Hurst Inn. The entrance is a mere 160 metres from the exit ramp. Yet, surprisingly, I heard no highway noise during my stay. With my “party planner hat” on, I can see that the Elm Hurst is ideal for parties and, especially weddings. My favourite, of their many banquet rooms, is The Carriage House. It really is a restored 19th century carriage house with a carriage balanced on the hand-hewn barn beams! In the event 49 rooms and suites may not be enough to host all your party guests, there are additional accommodations nearby. After all that party planning, you’re going to need some relaxation and the Elm Hurst can certainly accommodate. Its extensive Aveda spa is so amazing that there may even be hope for making me appear good-looking ... or at least feeling it! 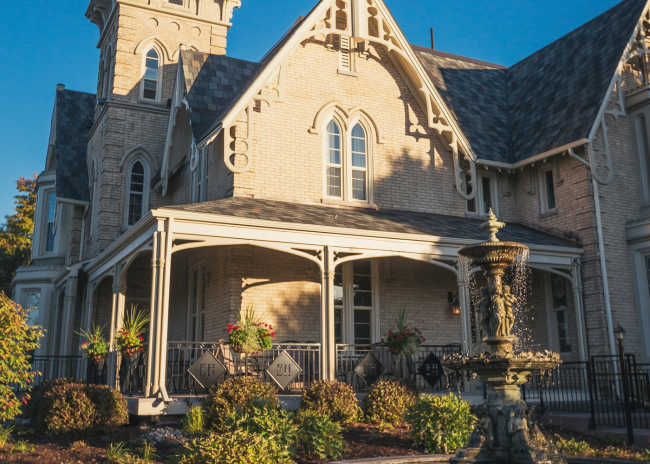 With lots of golf nearby, a wonderful bar, and an extensive collection of VQA wines available in its many dining rooms, it may be hard to not relax. Hat’s off to Alon, Theresa, their staff and the owner of Elm Hurst Inn & Spa for fabulous upgrades to one of the gems of Ontario’s Southwest. I was so impressed that I plan to spend a romantic weekend there with my sweetheart soon. Yes, I’m talking about my wife!